In today's world, prescribed medication for dogs are just as common as humans. It seems that whatever injury or pain we may be experiencing a prescription is written, but they can take a toll on our livers and kidneys. While some may be necessary, for others there are alternatives that work just as well if not better. Below are some homeopathic options that I've personally tested and approved. However, I must stress that is very important to check with your vet before giving anything to your furbaby. I may be a dog, but not all dogs are created equal. I would never want to put my fellow canines in harm's way and there's no guarantee it will work the same for you as it does for me. Turmeric is a great and strong anti-inflammatory caused by injuries, arthritis, and even cancer. When I strained my ACL and was suffering inflammation in my knee, my parents didn't feel comfortable giving me prescribed pills. After popping a couple of all-natural turmeric pills, I was up running around (even though I was supposed to be resting). You know how us Airedales are right? Stubborn. Ginger has been used as a natural medicinal for thousands of years in multiple different cultures. Being in the same family as turmeric, it also works well as an anti-inflammatory. What it's best known for is the tummy; reducing nausea and bloating. It can be used to relieve and also prevent. If you know your pup is prone to car sickness, give some 30 minutes prior to hopping in the car so he or she may fully enjoy the ride. It's also an immune boosting superpower. Not only has it been shown in studies to help fight cancer but can also help prevent and treat that nasty heartworm disease. A study performed by Visva-Bharati University in India, showed a reduction of heartworm larvae concentration between 83% to 98% in infected dogs treated with ginger. But be aware, ginger can thin blood causing unforeseen issues so make sure you consult with the vet before adding it to your dog's diet. Hemp is often confused as being the same as marijuana, but that's not the case. They do come from the same plant, but are not grown the same. Your dog (or you) can't get high from hemp and is non-psychoactive. Hemp is a multi-benefiting supplement that may improve our glorious coats, strengthen our immune system, boost energy, increase heart health, reduce inflammation, relieve pain, and calm anxiety and stress. Hemp for dogs is usually offered in oil form or baked into treats. Whichever you choose make sure you give the proper dosage. Most products provide amount information on the package. I've tried both. Remember that ACL strain? When I had too much energy, instead of giving me a pain reliever to sedate me, I was given a couple of drops of hemp. However, I wasn't a fan of it. After a while I knew it would make me sleepy, so I refused to take it. When I was having anxiety issues, I tried Austin and Kat CBD biscuits, which worked much better, but after a couple of tries I refused those too. But don't be discouraged to try it yourself, I'm extremely picky. It took 10 different types of dog food and four different types of protein before I found one that I liked. Coconut oil has become a widespread supplement "cure" for dry brittle hair to making a batch of cookies for humans. But can it do the same for dogs? You bet your bottom paw it does, and it tastes pretty good too. Topically, it can help with dry skin, provide a shiny and healthy coat, reduces allergic reactions, and treat yeast and fungal infections due to its anti-bacterial ingredients. When ingested, it can help with digestion, bad breath, prevent infection, assist in weight loss and so much more. There's tons of information on the benefits of coconut oil for dogs, but the most important thing to know is how much to give. You need to start off little by little and move your way up the measurement chain. The standard amount is to start off with a ¼ teaspoon per day for small dogs and puppies while 1 teaspoon for large dogs. After your dog's diet has gotten used to it, increase the amount by small increments. The final amount is about 1 teaspoon per 10 lbs of body weight daily or about 1 tablespoon per 30 lbs. Again make sure to check with your vet first or your dog may end up with a tummy ache and very loose stool. Cod liver oil… sounds divine doesn't it? I do love fish, especially those fresh out of the water. Unfortunetly I can't go fishing all year round to fulfill my omega 3 fatty acids needs. Omega 3's help the growth of flexible joints, a strong heart, good eyesight, healthy skin and coat, and energy if supplemented in our younger years. It also helps with brain health to remember all of our training and supports our immune system to fight off infections and other diseases. But the omega 3's doesn't work all on it's own, EPA and DHA, as well as naturally occurring levels of Vitamin A and D are also present in cod liver oil making a great team for our health. Listen, we all get a little freaked out or crazy hyper sometimes. Life can be stressful you know? There's multiple remedies to chill us out, a popular one being Benadryl - yuck. One of the best natural and oldest ways to calm down our four legs is with lavender oil. A study in the Journal of the American Veterinary Medical Association showed it can be effective for dogs with travel anxiety. Sprinkle a few droplets on our favorite blanket or bed, give it as a treat or a little spritz on our coat to get us in relaxation mode. Since I've been about nine months I've had a small issue with "wetting the bed" in my sleep. They haven't really pinpointed why. Some say it could be incontinence or that I'm simply so tired to get up. I was told that I may need to take hormones to subside it, but my parents didn't like that idea at all. Insted I tried acupuncture, and it was a great help. I've only needed two treatments in the last year and half. Even you don't wet the bed, acupuncture can be a great help for musculoskeletal problems, nerve injuries, skin, digestive and stomach problems, and respiratory problems. If you find a good acupuncturist, your dog shouldn't feel a thing. I didn't even know I had needles in me, and I was out like a light. Dog chiropractic may seem like a foreign concept to some, but it's actually been around 25 years. Dog chiropractic can help treat stiffness, neck and back injuries, hip dysplasia, lameness, and more. Sometimes a dog's body can get out of whack much like you humans. For example, tripping during zoomies, pulling on our leash or collar, sleeping in a weird position, playing too rough with another pup… sometimes a quick adjustment can get us right back on track. To find an AVCA certified dog chiropractor in your area, check out the American Veterinary Chiropractic Association website. Cold laser therapy uses light to stimulate cell regeneration and increase blood circulation to heal what ails your pup quicker. It can be used to treat acute and chronic injuries, sprains and strains, arthritis, disc problems, and muscular-skeletal problems. It also helps to regenerate nerve tissue after surgery. It's a simple procedure that can last anywhere from three to 45 minutes depending on the treatment each time required. The best thing about it is that all we have to do is simply lay down until the treatment is over. Check with your vet to see if they offer this service or can provide a recommendation. A young female airedale terrier leading the pack as Chief Barketing Office at Ville Magazine. I love bones, sticks, anything that squeaks, walks on the beach, my mom and dad, other dogs, little humans and of course, Ville Magazine. 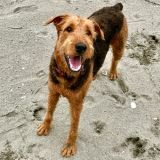 Follow me on Instagram @atlastheairedale!